Welcome to Alumni Spotlight, a blog series focused on our alums – where they’ve been and where they are now. 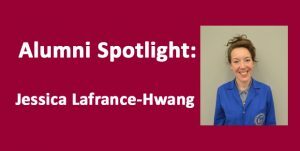 For this installment we interviewed Jessica Lafrance-Hwang. What degree did you complete at Cardiff? Did you pursue more education after you left, in any field? I completed the BSc Conservation of Objects in Museums and Archaeology program at Cardiff University in 2007. 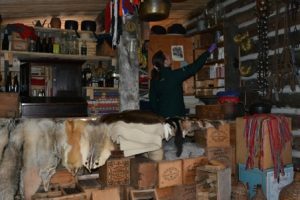 Prior to attending Cardiff University I had studied in the Applied Museum Studies diploma program at Algonquin College in Ottawa, Canada, with the focus of my studies being conservation. After finishing my BSc and working in conservation for five years I completed a Master’s degree in Art Conservation at Queen’s University in Kingston, Canada within the Mid Career Research Stream (object conservation). What have you been doing since you left Cardiff? Where are you now? Are you still in the heritage sector? If not why and would you consider returning? Since completing my BSc at Cardiff, I have been working in term and project based positions in conservation with a variety of institutions and companies. I have worked with the Canadian Conservation Institute both as a paid post-graduate intern in archaeological conservation, and as a conservator on an onsite heritage interiors project in the Canadian Parliamentary Precinct; on the West Block Rehabilitation Project (Canadian Parliament) with RJW-Gem Campbell Stonemasons; the Museum of Classical Antiquities at the University of Ottawa on a collection relocation project; The Henry Ford museum as the conservator for an IMLS-funded communications collection conservation and preservation project; and with Parks Canada as a member of the objects conservation team. This spring I started a position with the Conservation Division with Ingenium: Canada’s Museum’s of Science and Innovation. Ingenium’s Canada Museum of Science and Technology has recently reopened after a complete renovation and we are now preparing to relocate and consolidate the collections into a new storage facility being constructed onsite next to the new museum. I had the opportunity to do a short contract with Ingenium in 2016 to help prepare objects for display in the museum and I am very happy to be back working with this fabulous collection and preparing for a large scale move. 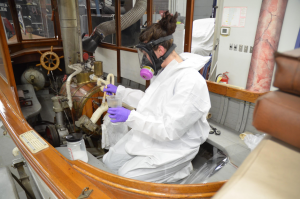 Covering and consolidating asbestos wrapping on components of a steam engine in preparation for display at the Canada Museum of Science and Technology. Have you done any freelance work? If so can you tell us about your experiences in the private sector? I have been working in private practice on a casual basis since 2010. It has been a great experience working on very interesting projects and treatments, dealing directly with clients who may not have otherwise had access to conservation services. It has also been a great way to bridge the gaps in employment that can occur between terms or projects. One such project was the relocation Museum of Classical Antiquities at the University of Ottawa. As the conservator in charge of the project, I advised and ran all aspects of the collection move, and was also able to advise and aid the staff in carrying out a total collection condition assessment in advance of the move to improve the museum’s standards long term. Another interesting project has been the treatment and ongoing maintenance of a Birch Bark Canoe in situ in a domestic departures lounge at the Ottawa MacDonald Cartier International Airport. This has been a challenge and learning experience in terms of working in a secure facility within timelines that best suit domestic travel patterns, and in very close proximity to the public. While working privately is very rewarding, it can also be very challenging. 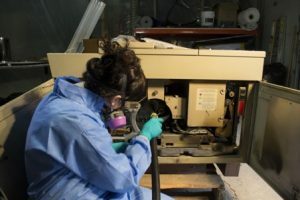 While you do consult with other conservators you are solely responsible for your treatment decisions and recommendations, which can be stressful at times when you are just starting out and still building your confidence and reputation as a professional. 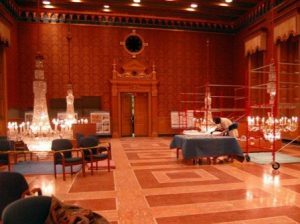 It is also difficult to make the treatment compromises that are at times required for objects that will not be returning to a museum environment if you are working for private clients or corporations. This sometimes means more or less intervention than you would like, but also a bit of lingering concern for the object’s health long term (the two a.m. ponderings of a conservator!) You also have to act in multiple roles at once – you are not only the conservator but also the project manager, human resources department (if your project requires additional staff), health and safety advisor, and the financial manager of your operation. What have been the highlights of your career so far? What are your favourite projects that you have worked on? There are been many great moments and projects in the decade since I graduated from Cardiff University. Working in the West Block of Parliament with the Canadian Conservation Institute, and then with RJW-Gem Campbell was really special. Both projects were challenging (for very different reasons), but it was a privilege to first care for objects being taken out of the building prior to rehabilitation, and then participating in the rehabilitation during the laser cleaning of the building itself. As the rehabilitation of the West Block nears completion, with MP’s preparing to move in and the building slowly unveiling itself in downtown Ottawa I have a renewed sense of accomplishment and pride in this work. Working on regency chandeliers in the West Block of Canadian Parliament with the Canadian Conservation Institute, prior to building rehabilitation. The IMLS-funded communications project at the Henry Ford museum was really special. As a team, we were identifying/retrieving objects in an onsite storage facility for mold remediation, curatorial review, stabilisation, cataloguing, documentation, publication on the web, and finally packing for long term storage. 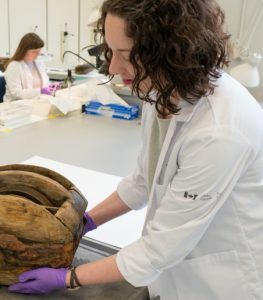 The team processed over 1400 objects in two years, and it served as a pilot project for future collection processing in advance of a total collection relocation. As the project conservator I had the opportunity to work on a wide range of materials, test new treatment protocols, and spend a lot of time with a fabulous collection in such a wonderful institution. I learned so much from my colleagues on this project and from the collection itself, the experience will stay with me forever. 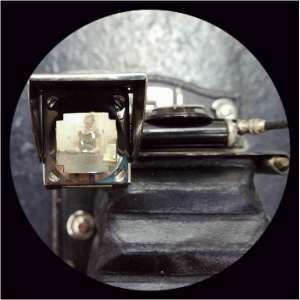 Taking a break during work on the IMLS Communications project to experience some of the wonderful artifacts we were processing, like this camera. Working with Parks Canada had many highlights. It gave me a meaningful connection to the collective history of Canadians as I was able to work on objects from all over the country. Visiting several historic sites as part of our in-situ preservation work was also important and really broadened my knowledge of regional challenges people face in the heritage sector, and gave me a better understanding of areas of Canada that were unfamiliar to me. I am sure preparing for the collection move at the Canada Museum of Science and Technology will be a highlight I look back on in the future. It is not often that you can join an organization at such a critical moment in their history and contribute to widespread institutional development. How has your Cardiff degree impacted your career? What was your favourite aspect of the programme? Is there anything you would change? The program I completed at Cardiff provided me with a really strong foundation on which I have been able to structure my career. The format of the practical lab courses and the requirements and responsibilities placed on me as a student (which tbh I found very strict and stressful at the time) prepared me to work with confidence quite early in my career. 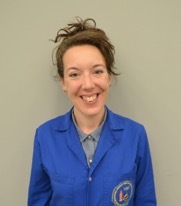 The strong decision making skills, critical thinking, research abilities, adaptability, and well rounded conservation theory I had after completing the program really enabled me to hit the ground running in my first jobs, and continue to aid me as I develop and take on increasingly challenging assignments. I found it very academically challenging coming from a very different learning system in Canada, and I struggled quite a bit with that. If there was anything I could change it would have been my personal level of preparation for that. I should also mention that Cardiff was an absolutely lovely and fun city to live in! I still miss it a decade on. There could not have been a better and more comfortable place to carry out my studies. If there is anything else you’d like to mention now is your chance. Plug your book or podcast! Share a picture of your cat! Share your most recent conference selfie! I often post pictures of treatments and projects I am completing on my personal instagram account @jessicalafrancehwang using #objectconservation. Fair warning – you will also be spammed with images of my adorable two year old son, dog, current craft endeavours, and garden! You can also follow the progress of the move, and everything else that is happening at the museum by following us on twitter @SciTechPreserv and on Instagram @IngeniumCanada. Thank you so much to Jessica for sharing her experiences and stories. Time to open the social media apps and give her a follow!